Where does Daemon rank among all the audiobooks you’ve listened to so far? Since I just finished Influx prior to this it's hard to place. But I'd put it in my top ten books (which I'll include whole series as a single book). What was one of the most memorable moments of Daemon? There is no one scene in this book that really moved me more than another as I felt the story kept rolling along at a good pace. But if I had to pick one it would probably be the set of scenes at the mansion in the early parts of the book where the Feds tried to breach the house. Sebeck was my early favorite but as a techie myself I ended up liking Ross much more. Sebeck's lack of tech savvy and his flaring emotions made me like him less and less as the book moved on. I'll also say that while Gragg's character did evolve some in the book and the level of disgust I have with him is palatable, Gragg as a character is pretty good. Often we find ourselves liking the good guy or the anti-hero, but we often over look a well crafted villain. My final comment is that I feel that Sobol was way too built up as this all seeing all knowing genius. My hope is that we find out that he was only the conductor of this plot not the sole inventor and implementer. I would love to see this made into a movie, but only by someone with real world technical expertise otherwise it would just be Hollywood fluff and that would ruin the story. As for a tag line...hmm..."The fall of Rome for the modern age." Very much so. This was my first venture into Daniel Suarez and I was not disappointed. Do not listen to the negative reviews. Especially those who say this book is too outlandish or that his use of technologies is too far-fetched. Those two aspects fit right in with this story. I am a tech-lover and this book gripped me and never let go. It was very hard to put down once I started. If you are a techie and love action and suspense this is a must listen for you. 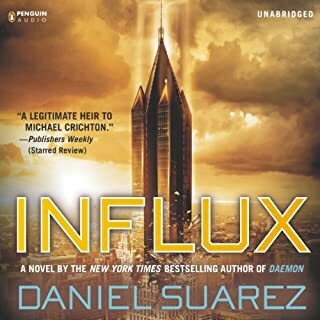 What other book might you compare Influx to and why? 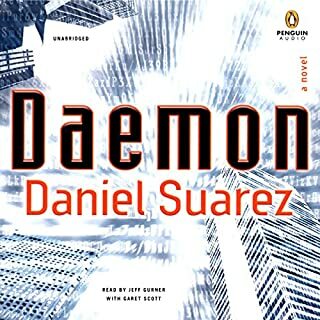 I can't really compare this to any other book other than another one of Suarez's, Daemon, which I just finished. But if you liked Daemon, this is a win-win for you, or if you like this then Daemon should be next on your list. As macabre as it may sound the scenes in the detention center/prison were some of the most riveting to me. The depths at which the description of the cell and the treatment of the prisoner took me to new depths of cringing. It was devilishly genius in its design and implementation. As I said about the prison scenes those really mad me cringe. The torture which he went through was unimaginable. I bought this book months ago and put of listening to it while I finished a few other books in other series. I wish I had jumped on this as soon as I got it. While I don't share many reviewers opinions that this the new "Michael Crichton" this was a gripping and fast action. I did feel that it took a bit to get going but once things started happening they didn't stop. You do have to suspend reality a bit in order to really enjoy this book. But if you are a sci-fi lover you'll feel right at home. Sure some of the tech if far-fetched but hey people would have said that same thing about technologies we use daily 10 years ago. 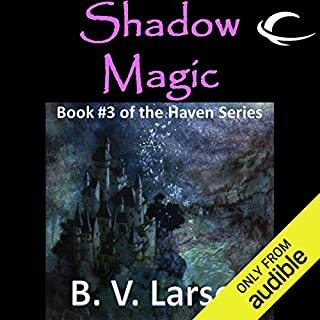 In Shadow Magic, the third book of the Haven Series, Herla of the Wild Hunt makes his move to gather all the Jewels of Power. Hunting down and killing those who wield them, the undead king is as relentless as death itself. He is not the only interested party, however, as several armies march to meet Brand and his allies in a desperate battle for control of the River Haven. Would you consider the audio edition of Shadow Magic to be better than the print version? I haven't read the print versions of any of Larson's books. So I can't comment. Mark Boyett does a great job. 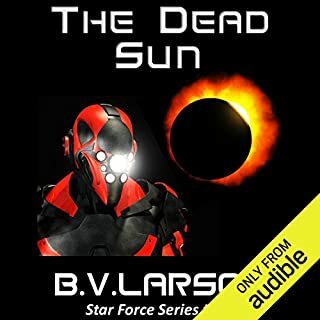 While I still hear him as Kyle Riggs from the Star Force series he does a good job with all of the Larson books he narrates. While I feel his range has limits and he reuses voices throughout the books he narrates it doesn't take too much away from this series and after three books I can't hear anyone else doing these. The battle at the end. It was more classic Larson than the rest of the series, although I did feel like it could have used more. After the first two books in this series I almost didn't continue on to the third. I really like the Star Force series and Larson's new Undying Mercenaries is growing on me. But this just felt like it fell flat. Short books, not much character detail, plot lines that don't go anywhere and seem disconnected. But in this book things started to come together and make sense. You really started to get a sense of who the characters are and what their purpose in this world is. I can safely say after this one I'll see the series to the end. As a plug if you haven't listened to Star Force give it a go. You won't be sorry. 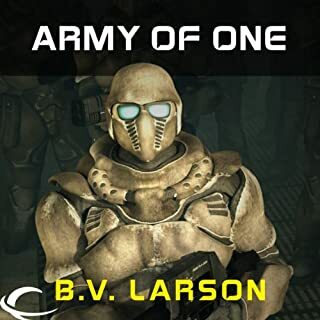 In BV Larson's "An Army of One" the Macros of the Star Force series invade from the skies, forcing a nanotized assassin into a deadly decision. If you could sum up Army of One: FREE Star Force Novella in three words, what would they be? What other book might you compare Army of One: FREE Star Force Novella to and why? Star Force is the first series of its kind that I have listened to so I can't really compare it. Yes. All the Star Force books, the new Steel World, and now the Haven series. I don't know how he would do with another author but he fits well with Larson. Although he does seem to have a finite amount of voices and you can hear then recycled. I can't image anyone else reading the Star Force books. Yes, I'm really engaged in this series. I picked it up and haven't stopped yet. Normally I'd say Riggs without hesitation but after listening to the one off with that focuses on Bjorn (Gaines) I'm really starting to fall into the Gaines camp. He didn't play as big a role in this book but he is developing nicely in the series. Hmm, that's a good question. I'd really like to see this hit film. Although I feel like with the length of the series and the depth that could be lent to the characters this would be better as a television series. Although, we have to be careful to keep away from Fox as they would probably kill it like they did Firefly. I'm a huge fan of the Star Force series by Larson. What makes these books for me is that Mark Boyett does a great job of narrating. He doesn't have a wealth of voices and if you are a fan of the Star Force series you'll notice a few of those voices are reused, but he does a great job pulling you in and making you part of the story. 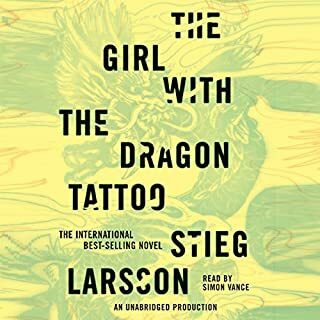 I'm still getting to know the characters but I'd have to say the McGill is not my favorite as you would think given that Larson's books often come from the vantage of a single character. I really like his commanding officers or his obnoxious friend Carlos. I don't want to say more as I don't want to ruin anything for you. While I didn't "love" the scene and at it's place in the book it could be seen as a throw away but the scene when he first arrives in space and the air is leaking out of the ship. It really sets the mood for the legion he has joined and gives you a good idea of his overall character. I thought this could have been done better and certainly more in depth but the first time McGill dies and is brought back. His ruminations on what the implications of the revival machine certainly had me thinking. Decent start to a new series. 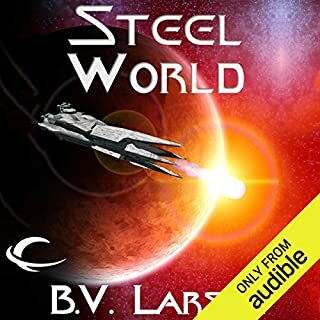 It's no Star Force but I enjoyed it and will certainly give the next book a listen. If you haven't listened to the Star Force series I highly recommend it. 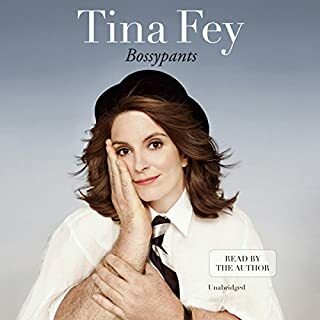 I love Tina Fey, I love 30 Rock, I like this book. I really enjoyed listening to this book. My only real problem with it was the quality of the audio recording. In many parts Tina would fade out almost inaudibly. Other parts it sounded like it was being recorded in a small echoing room. I expected more from this recording. Still a good listen to. I knocked it out in just two listens. 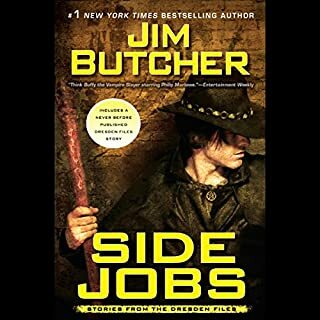 A great collection of Dresden stories and as always Mr. Marsters is top notch. I only wish there was more. I have to admit that I had this book for a few months before I really gave it a chance. I started and stopped it a few times. Then I got caught in a snow storm while driving and had a lot of time on my hands so I dug in. I was not disappointed. This, along with the other books, was a extremely well written and narrated series. It is lengthy, it is in depth, but it is worth it. And Simon Vance does a great job. 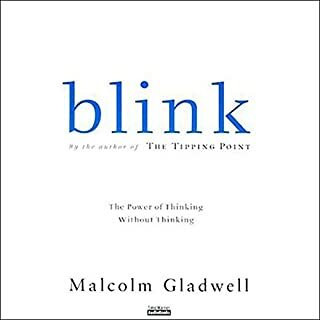 It's hard for me to write a review for a Gladwell book because I've liked everything he's written and this is no exception. His narration is top notch. If he ever stops writing then he'd have a great career as a narrator. Pick this one up, and all the others you can find. Just make sure they are unabridged, accept no substitutes.